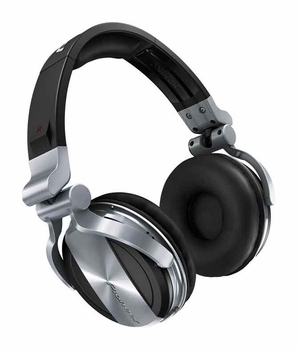 Pioneer HDJ-1500 Advanced Professional DJ Headphones (Silver) DJParts - All Variety of Parts that DJ Needs. Large Diameter Speaker Unit High power input (3,000mW) for monitoring a high level of sound, and a hermetically sealed body with high sound-insulating ability. Folding Housing With Universal Joints Joints allow you to fold the headphones for space-saving and to turn them in each direction for free-style single ear sound monitoring. Soft Touch Housing Designed with DJs in mind, the housing can rest against the shoulders for stability and comfort. Stereo/Mono Selector The selector allows you to mix right and left channel signals for single ear sound monitoring. Cord Assembly Available as service part.